1. 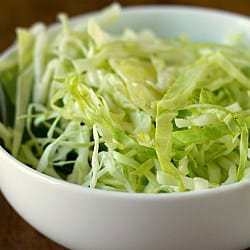 Toss the sliced/shredded cabbage with the vinegar and oil, tossing to coat evenly. Add the sugar, salt and pepper and toss again to evenly distribute. Refrigerate until ready to serve.